About a year ago, the American Heart Association released new cholesterol management guidelines. These guidelines changed how we practitioners should deal with cholesterol evaluation and management almost to a revolutionary degree. They are a BIG departure from past thinking. For example, under the old system, we practitioners were supposed to follow cholesterol labs. We were supposed to get LDL levels down below 100. Not anymore! In fact, under the new guidelines, once you have started someone on therapy, you really don’t have to check their cholesterol ever again! Really! Also, the new guidelines say that there is basically only one therapy for almost all lipid patients: statins. According to the new guidelines, we should get rid of all other lipid therapies. Niacin? Throw it away. Gemfibrozil and fish oil? Get rid of them. What about triglycerides? The new guidelines say that you should only treat hypertriglyceridemia with medications when the triglyceride level is greater than 1000mg/d. Holy cow, 1000! Where did that come from? This document is almost revolutionary in its sweeping changes. It makes treating hyperlipidemia so very much easier. In my opinion, all correctional practitioners and nurses involved in chronic care clinics should know the new guidelines. If you have not already done so, you need to re-write your lipid protocol. Where did the new cholesterol guidelines come from? The cholesterol guidelines that most practitioners have relied on in the past were written by the National Heart, Lung and Blood Institute (NHLBI) in 2001 and updated in 2004. Of course, a lot of research has happened since 2004 and it was apparent that the old guidelines were out-of-date. The NHLBI began writing an updated version but half way through they decided to get out of the guideline-writing business. Fortunately, the American College of Cardiologists and The American Heart Association (ACC/AHA) stepped in to finish the project. Their final report was entitled: 2013 ACC/AHA Guideline on the Treatment of Blood Cholesterol to Reduce Atherosclerotic Cardiovascular Risk in Adults. What new data influenced the ACC/AHA to change their guideline recommendations? It has long been known that people with bad cholesterol numbers (high total cholesterol, low HDL or high LDL) have an increased incidence of bad medical outcomes such as death, heart attacks and strokes. What was not known for sure was whether having high cholesterol caused that heart attack or was merely associated with it. I have found that this distinction between causation and association is hard for many people to wrap their heads around. However, here are two good examples can make the distinction clear: People who have a lot of ashtrays in their house have an increased risk of heart attacks. But if you take the ashtrays out of the house, the incidence of MI will not change. This is because the ashtrays are not causing the heart attacks; smoking is. And it just so happens that smokers tend to use ashtrays. So the ashtrays are associated with heart attacks but do not cause them. Similarly, people with gray hair have an increased risk of dying, but if you dye their hair brown, it will not decrease their risk of death—because, of course, the factor here increasing health risk is age, not hair color directly. So, that leads us to this fundamental question: does high total cholesterol directly cause heart attacks, strokes and death? We have long believed this and assumed that any reduction in bad cholesterol numbers would translate to decreased risk of heart attacks, stroke and death. This led to the previous guidelines focusing on cholesterol numbers. According to the old guidelines, total cholesterol should be reduced—by any means possible—to less than 200. LDL should be less than100. HDL should be greater than 60. 1. Statins reduce cardiovascular risk in people with good cholesterol numbers as well as in people with high cholesterol numbers. So patients with known coronary heart disease should take a statin even if their cholesterol numbers are pristine. 2. Statins are the only class of cholesterol lowering agents that reduce the risk of cardiovascular events like MIs, strokes and death. Niacin, for example, will improve your cholesterol numbers, but will not improve your risk of a heart attack. Same thing for Lopid, Fish Oil and anything else that is not a statin. The conclusion is inescapable that statins improve cardiovascular outcomes not by lowering cholesterol but by some other mechanism, maybe by reducing inflammation. Also, like ashtrays and gray hair, bad cholesterol numbers are associated with cardiovascular risk, but do not directly cause cardiovascular risk. These findings and this conclusion are the driving forces behind the new ACC/AHA cholesterol guidelines. What drugs should be used in the treatment of cholesterol? This one is easy. As I have already said, there is just one class of call of drugs to treat high cholesterol in the vast majority of cases: statins. Everything else, you can pretty well forget. The new ACC/AHA guidelines also do not endorse any one statin over another, so you can ignore the TV ads and use the inexpensive generics without guilt. Nonstatin therapies do not provide acceptable ASCVD risk reduction benefits compared to their potential for adverse effects in the routine prevention of ASCVD. The guidelines follow up this statement by citing the studies that support this statement. If you are interested, you can look them up. But in the meantime, this could be a great cost-cutting initiative in your facility! Identify those patients in your system who are on non-statin cholesterol agents and discontinue them. The only real question in the new guidelines is whether you should use “high dose” or “medium dose.” More on that later. Who should be treated with a statin? 1. Patients with an LDL of greater than 190. This, of course, is a huge LDL and can only be found in people who have a genetic defect in cholesterol metabolism. This, by the way, is the only time when you would prescribe medications based solely an isolated number. 2. Patients with known atherosclerotic cardiovascular disease. These are patients who have already had an MI or a stroke, or had a coronary stent placed. Or they may have had a TIA or claudication from peripheral disease. According to the new guidelines, these patients should be prescribed a statin no matter what their cholesterol numbers are. 3. Patients 40-75 years of age who have diabetes. 4. Patients 40-75 years of age who have a calculated 10-year cardiovascular risk of greater than 7.5%. For this, you will need the ACC/AHA-Signature Handy-Dandy CV Risk calculator, downloadable here. This one is, by far, the most controversial of the new guideline recommendations. I won’t go into the controversy here, but the question is, why 7.5%? Why not 10%? And where did this “Risk Calculator” come from? How accurate is it? As a take home message, though, the use of statins in the first three categories of patients is not controversial. The use of statins for primary prevention in otherwise healthy people is controversial and is still being debated. What about lipid levels? When should I order them? One of the main changes in the new cholesterol guidelines is the de-emphasis on following cholesterol numbers. It used to be that we treated until we achieved a number goal, such as an LDL of less than 100 and an HDL of more than 60. The new guidelines make these targets, for the most part, irrelevant. So when are lipid numbers useful under the new guidelines? 1. An LDL of greater than 190 triggers statin therapy. 2. Total cholesterol and HDL cholesterol numbers are used in the ASCVD Risk Calculator. So if you need to calculate ASCVD risk in a patient not already taking statins, you need to measure these numbers. 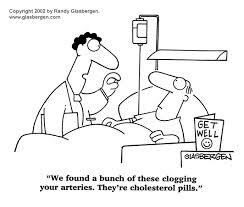 Once a patient is on statins, since you are not treating to a goal number, you really never have to check their cholesterol numbers ever again. The ACC/AHA guidelines say that the main reason to recheck cholesterol numbers after the initiation of statin therapy is “to determine a patient’s adherence.” But in corrections, we already know whether our patients are taking their medications. We just have to look at the Medication Administration Record! I suspect that many of us will continue to get the yearly cholesterol tests in patients already taking statins, because it is so ingrained as a habit. Just recognize that you now don’t have to. If you are looking for ways to save a little money at your facility—well, this now fits under the category of “unnecessary testing” for many patients. What dose of statin should we prescribe? This also is pretty simple. Based on an individual patient’s cardiovascular risk, the AHA/ACA recommends that you start either “moderate-intensity” statin therapy or “high-intensity statin therapy.” I will not summarize which patients fit in each category; you can look that up later (I’ll attach a reference table at the end of this article). However, note that there is no recommended “low-intensity” statin therapy. Many of our patients are on too low of a dose of statins according to these guidelines. 1. Although we have been talking mostly about statins, the guidelines emphasize that Lifestyle Changes are the “foundation” of cardiovascular risk reduction. They mean by this not smoking, exercising, eating right and losing weight. This is more important overall than statin therapy. 2. These guidelines pertain to patients aged 40-75. The guidelines say that there is not enough data to recommend for or against statin therapy in age groups older than 75 or younger than 40. I myself have often scratched my head about why anyone would want to prescribe cholesterol meds to, say, a 90-year old nursing home patient. According to the new guidelines, I can DC these prescriptions without feeling guilty. 3. Although statins can cause muscle pain (in fact, this is their main adverse effect), you don’t have to do routine CK testing in statin patients. 4. The guidelines recommend checking liver function tests before initiating statins (and holding off if they are abnormal), but after that, you also don’t have to do routine LFTs any longer. 5. The guidelines acknowledge that there is an increased risk of diabetes and hemorrhagic stroke in patients taking statins, but argue that the benefits of taking statins in the patients we are talking about outweigh these risks in most patients. The AHA/ACC could not find evidence that starting triglyceride-lowering medication therapy for TG levels of 500-1000 mg/dL lowered the risk of hyperlipidemic pancreatitis. They recommend evaluating and addressing secondary causes of elevated TG levels, and implementing diet and lifestyle modifications first for these patients. b. Age 40-75 with Diabetes. d. Estimated 10-year cardiovascular risk of > 7.5% (using the AHA/ACA signature Risk Assessment tool ). 2. Do not use any other cholesterol-lowering agents other than statins in most patients. 3. There is no preferred statin. Use a cheap generic. 4. Prescribe statins as “high intensity” or “medium intensity,” depending on the cardiovascular risk. 5. Once you have prescribed a statin, further cholesterol testing is mainly “to determine adherence.” There are no number based treatment goals like there used to be. 6. Lifestyle changes (not smoking, exercise, losing weight and not eating junk) are more important than drug therapy. 7. The usefulness of statins in most patients younger than 40 or older than 75 is not known. 8. Statins have potential side effects! You and your patients should know about them. 9. Hypertriglyceridemia should only be treated with medications when the triglycerides are greater than 1000. Have the new cholesterol guidelines changed how you practice in your facility? Please comment! This entry was posted in Guideline, Medical Practice, Practice Management and tagged cholesterol, correctional medicine, evidence based medicine, Guideline, inmates, jail medicine, jails, prisons, Triglycerides on January 24, 2015 by Jeffrey Keller MD. Your summary of the new AHA/ACA guidelines/recommendations has caught my attention. The new simplicity sounds almost to good to be true. Now, I will need to read this document in more detail just to make sure you didn’t leave anything out.